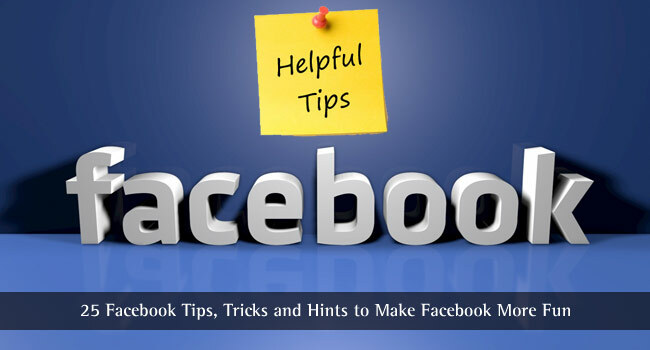 Here are Facebook tips to enable you to use Facebook to your best advantage. Some of the Facebook tricks are standard and available if you look for them. 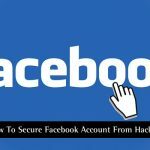 However, many people do not take the time to learn all there is to know about Facebook, and if you need any of the services, functions or tricks and tips below they are presented for you to use. Facebook normally requires your first and second names, and shows these as your account name. However, some people prefer only their first or second name to show, and there is a way to achieve this. 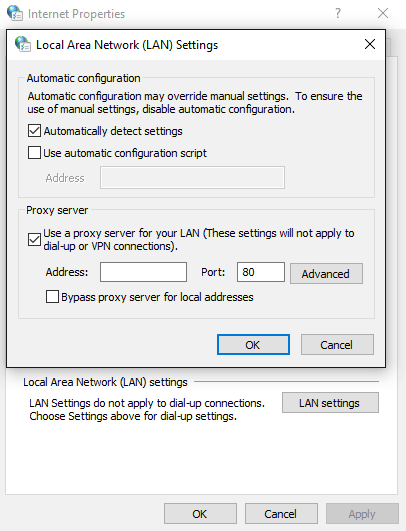 b) On Chrome go to Settings -> Show Advanced Settings -> Network. The IP address goes into ‘Address field’ and the Port number goes into the ‘Port’ field. Click ‘bypass proxy server. . .’ then OK.
Now go to your Facebook Account ‘Settings’ and change the language to Bahasa Indonesia. Facebook now thinks you are Indonesia. Remove the last name on your Facebook name and Save. No go back and change your language to your original, e.g. English US. 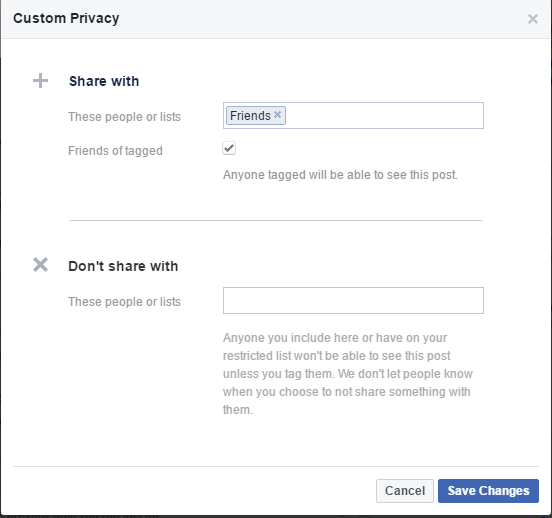 You will now have only your first name showing on your Facebook account and posts. Normally it is not possible to be logged into more than one Facebook account at a time. If you are using Chrome or Firefox, it is possible to create another user profile. So: Go to Chrome -> Settings -> Users or People -> and click on ‘Add New User’ or ‘Add Person’ depending on your version of Chrome. You can do the same using Firefox. 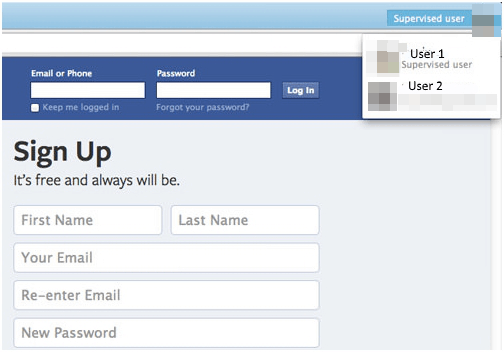 When you login, you will see both users at the top right on Facebook and you can choose either. Login for each user and you have two users open on your account at the same time. Both of them you of course! Using this tip, you can come up some amazing profile images that are also part of your Facebook Cover photo. Go to Tricked Out Timeline to find out how you merge your profile and cover photo, take a section of your cover to be your profile picture or even zoom your profile picture up to create a cover. If you use the Facebook Events feature you will know where to find it – click ‘More’ under your cover image and scroll down to ‘Events’. If you also use Google Calendar, then you will likely find it useful to sync your events into your Calendar. This is not difficult to do. First, Login to Facebook, go to your ‘Home’ page (Not Timeline) and click on Events on the left hand side. At the bottom right you will see links to ‘Upcoming Events’ and ‘Birthdays’. Click on each to get a link address. Copy these. Second, access your Google Calendar page and find ‘Other Calendars’ on the left of the page. Click on the Down arrow button, and select ‘Add by URL’. Paste the first link and click on ‘Add Calendar’. Do the same with the other link and you have now synced the two calendars so that any new event added to Facebook will also be added to your Google Calendar. Go to your Friends Request Page and make sure all the requests are loaded. Scroll right down to the end of the page if you have a lot of them. Click on Enter and you should see that what you want to happen does happen! After creating your status or post, click on the Friends or Public button under the post (depends on how your Settings are configured). You will get a drop-down menu that should read Friends, Public, Custom and More Options. Now you get another drop down menu with several options: click on ‘Custom’ again. You now get two windows – use the one titled “Don’t Share with this” to add the names of the Friends you want blocked from seeing your post/status. You usually login with your email address and password. However, it is possible to also login with your username or phone number in place of your email address. Visit this link: FB User Name to find your Facebook username or create one. Facebook notifications are not silent! They make a noise when they arrive, and you may want to remove that annoying sound if you tend to get a lot of notifications, particularly if you have a young sleeping baby in the house. It’s easy to turn them off – the sounds, not the notifications – and here’s how. Click on the top right down arrow and go to Settings. Click on Notifications on the left-hand menu. You change both to OFF or to ON or have one OFF and one ON by clicking on the relevant buttons. Facebook can track your browsing history on your main site, or on those sites that use Facebook Connect. This tracking can then be followed by Facebook giving you adverts that are related to what you have recently been browsing! If you use the Google Chrome browser, you can stop this by going to the Google Chrome Webstore and searching for Facebook Disconnect. If you’re a Firefox user then add-on is there for Firefox. Follow the simple instructions that come with the app and you will have stopped Facebook from being able to track your browsing. 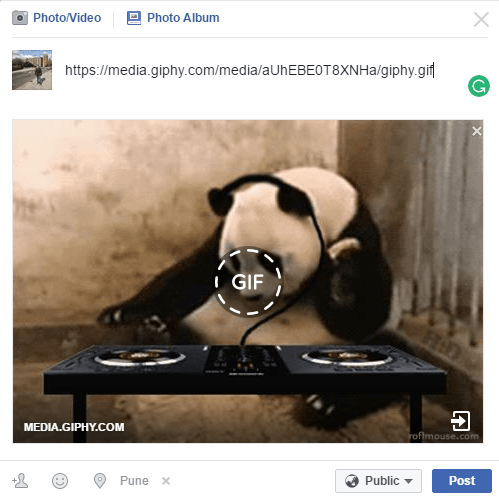 It is easy to display animated Gifs with a play button on a status update. Simply go to giphy.com and you will a huge selection of Gifs to choose from. Pick the one you want to post and simply share it like any other Facebook Update. You can create your own conversation; Stalin with Hitler, Obama with Cameron – whatever you like using The Wall Machine. You can forge Comments, Likes, Statuses, Event Attendance and so on using this service. Go to The Wall Machine for full instructions. Sometimes you may want to blur out the name and profile picture of a shared status. If you are using Chrome as your browser, there is a software app that can do this for you: Status Snapper. Once downloaded and activated, go to Facebook and you will see a square icon to the right of the address bar of your window. When you are checking out your feed and see a post you want to share, then click on that icon in the URL address bar. You will then see icons with the word SNAP attached to each status or post. Click on that related to the status you want to share, and the Image and Name will be blurred so the original source of the status cannot be identified. Facebook users often lose important messages, videos and other media they would desperately like to recover. Here is how you can achieve that. b) Click on “Download a Copy of Your Facebook Data” then enter your FB password when requested. c) You will now be sent a ‘verification’ email – access that and click the verification link it will contain. Your data will now be compiled and delivered to your email address. d) Download the file in the link and unzip it. You then have all your old and latest data. c) Click the ‘Download’ button. The image will then be downloaded in the same quality as the original. Now, Deselect the apps and games that you no longer want notifications about then click ‘Close’. You will now not receive notifications about the apps and games you have deselected. Use your own message. Try it yourself and you will find it leads to your own Facebook page. You can use any catchy or interesting message you want that will make the recipient click the link. 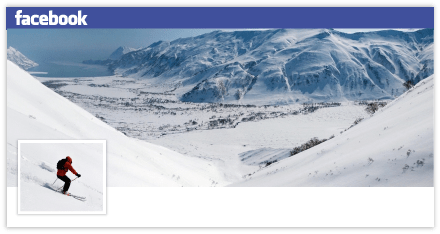 If you are using Google Chrome as your browser, there is an extension available that zooms the size of Facebook timeline photos and thumbnails by hovering the cursor over them. Get Photo Zoom for Facebook here. If you are using Firefox, you can get that plus a lot more on Social Fixer for Facebook. You may occasionally have the need to turn off Chat for selected people. There can be a number of reasons for this, and Facebook recognizes that by permitting you to so. Many people are unaware of this feature, so here’s how to use it. 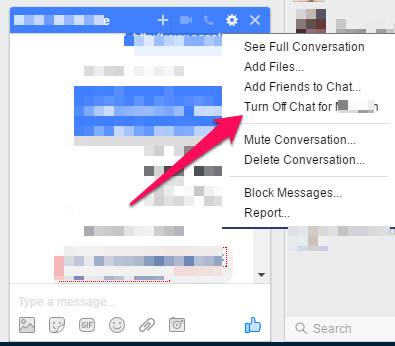 a) Open the chat box of the friend in question – do this by clicking their name in your chat box. b) Click the gear wheel Settings icon. As you can see, you can also delete a specific conversation from chat history or even report specific messages as being spam or abusive. It pays to check the ‘settings’ icon on any of Facebook’s features, because they often provide options you didn’t realize were available. You can then turn off such notifications by clicking the appropriate link. Click the appropriate option to change the auto-play function on Facebook. Note: you can also change the video quality from this page. You will now be able to update your Facebook status by sending a text message to your FB account. Like many other social media sites, Facebook offers users a list of keyboard shortcuts to make life a lot easier. Each type of computer: PC and Mac, has its own shortcuts, and they also change according to the browser you are using. Here are the options for each. We are using the hash # in place of the shortcut keyboard key. Simply replace # with the Keyboard keys given. For example, on a PC using Firefox you would enter Shift + Alt + 0 for Facebook Help, while on a Macbook with Firefox it would be Ctrl + Opt + 0. Finally, just a quick tip about nicknames. Facebook generally doesn’t let you use a nickname, but if you go to Settings -> General and click on Name you get to add other names – use your nickname, click to have it show on your profile and your nickname will appear alongside your real name on your profile. So friends who know you by your nickname will be able to identify you. Nice article bro. You’ve covered good facebook tricks. I will sure give it a try. Multiple friend request tricks is really important especially for fake id. I did not know about it before. I’ll remember these things, keep it up. Nice tips Rajesh! How about verifying Facebook pages. I have seen a guy do it for very many people and I wonder how he does it. This is one of the best posts. 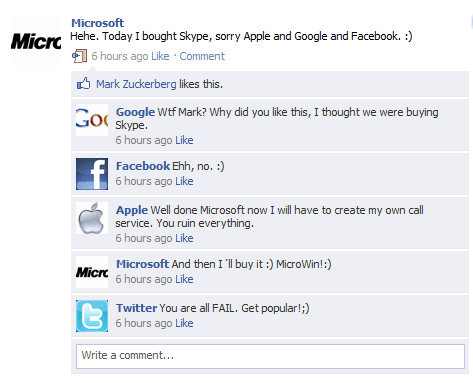 I think people could enjoy facebook in different way with this. Thank you so much! Rajesh Namase sir. Very interesting piece of information you have shared here. Thanks really love your senses of writing. Thanks once again. Very properly explained all features as they are really useful on daily basis, will try to add multiple profiles and test the steps. I was searching if accepting multiple friend requests is possible or not and found your articles I am a social media expert and really found this article too helpful. Really awesome list of tips. Great post. Thanks Admin!